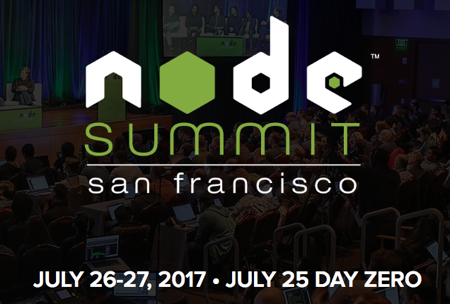 We’re excited to be part of Node Summit in San Francisco on July 26-27. IBM is helping sponsor the event, and the StrongLoop team will be joining IBMers to talk about the ecosystem of node.js. Sai Vennam from the StrongLoop team will be there to talk about what we can expect from LoopBack.next, the next step to make LoopBack effortlessly extensible. He’ll be available at the IBM booth to discuss it in more detail. We also recommend the IBM Sponsor Workshop on Wednesday morning to learn how Accenture uses Node.js and IBM Watson Developer Cloud to rapidly build prototypes for clients. Developer Workshop @ Galvanize (12 - 5 p.m. PT): IBM will convene a hands-on TJ Bot workshop, hosting 20-30 developers with the objective of teaching developers how to build IoT applications, increasing awareness around IBM technologies and increasing the Bluemix user base, specifically. The event will feature a hands-on experience with IBM Developer Advocates from the San Francisco team where participants will be able to build their own TJ Bot. Meetup @ Galvanize (6 - 8 p.m. PT): Following the workshop, IBM will convene a meet up centered on Node-RED. Speakers include Max Katz, IBM’s Developer Advocacy Program Director in San Francisco and Kris Borchers of the JS Foundation providing introductory remarks, followed by IBM’s Nick O’Leary speaking about Node-RED and JeanCarl Bisson who will showcase examples of applications that can be built in Node-RED using IoT, Watson and other services. Want more info on these two events and more IBM-led activities? Click here. You can learn more about Node Summit and register here.